Good morning! Heather here with a soft and simple Valentine card to share with you featuring some masking, distress ink blending, and a bit of sparkle with clear embossing powder! 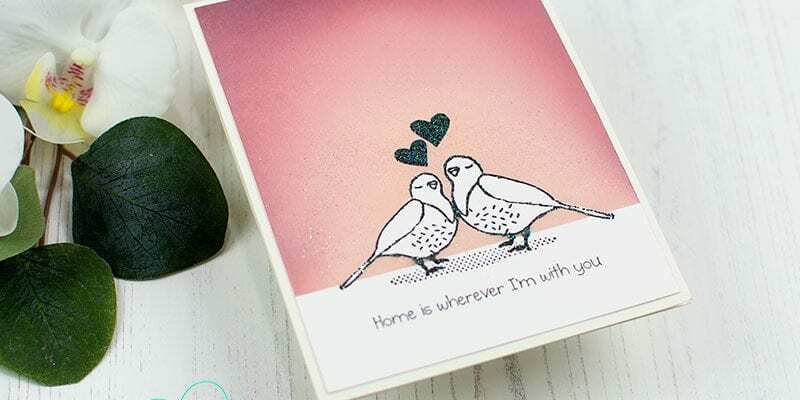 I’m using the cute image from Dove Love, and the perfect sentiment from the May 2018 Sentiment Kit – With You I’m Home. I’ve really been loving playing with different Distress Oxide color combos lately – and this is a new favorite that I hadn’t tried before! I used Tattered Rose, Victorian Velvet, and Aged Mahogany. And don’t you love the touch of sparkle with the clear embossing powder?!?!? I thought that was such a fun touch and effect!